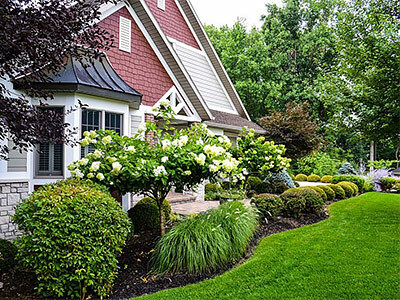 Your landscape plays a very important role in the overall appearance of your property. It’s one of the first things that anyone visiting your home sees. Aside from this, the landscaping can become the perfect leisure and entertainment spot; but that can happen only if it is designed with care an attention to detail. Most people get the outdoor spaces of their property when they are building their new home or moving into an existing one. In this case, they need start-to-end design and install solutions and we have the ability, experience and resources to manage this is an expert manner. However, many homeowners also look to upgrade different features on their property and we handle these smaller jobs with equal expertise. We at Mother Nature Landscaping are a full service company that has handled a number of small and large scale landscaping projects for customers in and around Bloomington, Martinsville, Mooresville, Bedford and Columbus. Over the years we have also catered to customers across Franklin, Seymour, Greencastle, Greenwood, Plainfield as well as Beech Grove. Softscaping - This includes all the plantings, lawns and trees. The flower beds and planters are also a part and parcel of softscaping. We have over 100 years of cumulative horticultural experience and that gives us a very solid base to provide you the kind of solutions you need. Softscaping isn’t just about buying some plants and trees from a nursery and installing them on your property. Every plant, shrub and tree has different planting needs and so when a landscape is being planned, care has to be taken to ensure that the ones we pick have similar watering needs. This helps simplify the irrigation system installations and helps you save money as well. Hardscaping - This constitutes the elements that are made of masonry and can include retaining walls, paver installations, patios, decks, poolscaping, outdoor kitchen, boundary walls, planter installations, garden steps, and walls with in-built seating, fireplaces, fire pits and more. All these features become the base on which the rest of the features in the landscape will be designed and installed. We use very resilient and weather-resistant materials in this space and this adds to their durability and functionality. In addition to these basic aspects, a landscaping project will also include outdoor lighting installations and water feature design and installations. Some people like to get fountains, waterfalls, streams or ponds installed and we can incorporate these elements into the broader landscape design. Irrigation and drainage system design and installation as well as maintenance are the other aspects of the project that we handle as well. If you looking for reliable and well-established residential landscapers, you need look no further than our company. You can discuss your project details with the specialists at Mother Nature Landscaping and we will provide solutions at very reasonable landscaping cost. The number to call is - 812-339-5296. You can also contact us via this online form or request for a free consultation and quote via this form.